The government shutdown was no biggie, at least according to the October jobs report. The economy added 204,000 jobs during the month and the two previous months were revised higher by a total of 60,000. In the blink of an eye, the three-month average increased from a paltry 143,000 to a respectable 202,000. The Labor Department noted that "there were no discernible impacts" of the government shutdown in the survey that measures payroll numbers, wages and hours worked. However, the shutdown impacted the household survey, which showed a 448,000 increase in the number of temporary layoffs, a category under which furloughed government employees fall. (To put that number into perspective, the rise in temporary layoffs in September was just 25,000.) As a result, the civilian labor force tumbled by 720,000 and the labor force participation rate fell by 0.4 percent to 62.8 percent, a rate last seen 36 years ago in 1977. The better than expected jobs report immediately increased speculation that the Fed will begin to taper its $85 billion monthly bond purchases at the December 17-18 FOMC meeting. Lawmakers will be able to ask the Fed Chairman nominee more about central bank strategy, when Janet Yellen's Senate confirmation hearing begins this week. While it is anticipated that the Committee will approve her nomination, market watchers will be listening for any clues about future policy action (or inaction). 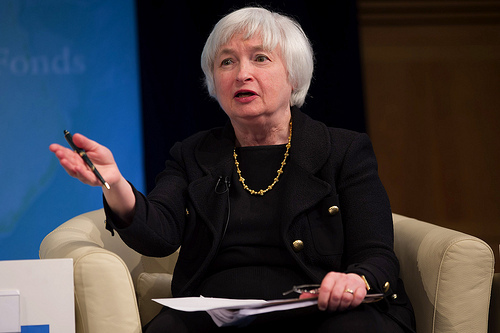 She will like quote from the Bernanke playbook: the Fed will begin pulling back from purchasing bonds when the economic outlook improves. MARKETS: It was another record-breaking week for large stock indexes.